Mechanical work to some people is the knuckle-splitting, swear-inducing bane of their existence. For me, it's a relaxing source of satisfaction. Body work, however, is like volunteering to be a rower on a Viking slave ship - tiring and tedious with no end in sight. 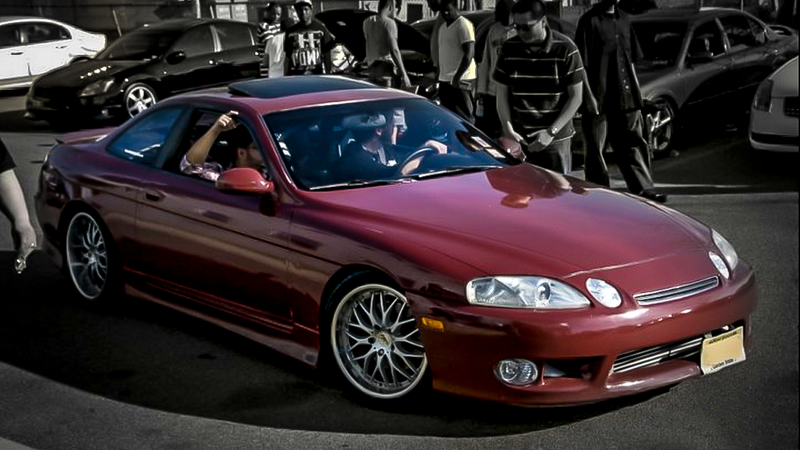 Without further ado, here's how I prepped and painted my Lexus SC, by myself, for the first time. If you've been following along with my long-term Lexus SC300 disaster project, you'd have known that I bought this car from what was essentially a junkyard and installed an imported JDM 1JZ-GTE engine in it because the first and probably only thing a falling apart automobile needed was more power. By the time the engine was installed, I had sourced a bumper from a '97 Lexus SC300, a mismatched Vertex body kit, and 18" front/19" rear staggered wheels. The car was coming together, but the body work was a multicolored mess and in desperate need of overhaul, so I mustered up the courage to call local body and paint shops to get a quote on a professional paint job, and they replied with a number that had many, many zeros in it. So many, in fact, that I checked my likely double-digit bank account balance just to see that it hadn't collapsed in on itself by proxy. There had to be a better way. "I can paint this thing myself. How hard could it be?" I asked myself while I stood in a three-hour line for a free two-piece and a biscuit at KFC, courtesy of Oprah. I did my research and ordered the cheapest paint my barely adult hands could get, which was an all-in-one kit for about $300 from Kirker Automotive. I opted to get the Merlot Red single stage Urethane, which was a shade darker than the stock Garnet Red that the Lexus came with in 1992. Now that I had the paint materials sorted, I had to find a place to actually paint the damn thing, because painting in my driveway was probably one of the best ways to get the cops called on me, and I was too pretty to go to jail...back then. Once again, I called all the repair shops around my area and asked if they would rent out their booth for a day or two during their off-time, for me to get to the sweaty business of prep and paint. Surprisingly, I got a willing owner saying that I had Saturday and Sunday to do what I wanted, and for this privilege he took three of my most crumpled-up Benjamins. Deal. I boosted the car to the shady, old-timey looking shop and started sanding with the provided air-powered dual-action sander until breathing was a luxury. Please note that at this point, I had only watched YouTube videos on body work. I had no idea what I was doing at all. I laid a spray paint guide coat on top of the parts that I sanded to give a smooth surface, at least that was the plan. Some of it worked. Some of it didn't, not helped by the fact that the shop was almost impossibly muggy, because it was the middle of summer and the shop owner didn't want to run the air conditioning for a novice peon like myself to paint his cheap car with cheap paint and cheap labor. When I felt the car was ready (read as: I just wanted to go the hell home already), I primed the car and the bumpers and body kit with white high build primer, then sanded the entire car, again. There's a certain satisfaction to be had in a job when you accomplish something yourself, even if the result is somewhat lackluster. It's the knowledge that you stood up to a challenge and came out victorious on the other end, with many valuable memories along the way. The paint job wasn't stellar by any stretch of the imagination - the body work was wavy in some places, there was light overspray in the nooks and crannies where I didn't think to mask off, and I had small runs in two places - but that didn't matter, because the car was one color, and I made it that way, and if I was so inclined, I could do it again and it would be just as rewarding. If you want to find a diamond in the rough that'll be the ultimate test of skill and patience, try and find something cool (and cheap) here and make it freaking amazing.